alaTest has collected and analyzed 135 reviews of JVC GR-D30. The average rating for this product is 2.4/5, compared to an average rating of 4.0/5 for other Camcorders for all reviews. Reviewers are impressed by the size and portability. The image quality and usability also get good views. There are some negative reviews about the durability and reliability, while there are some mixed opinions about the zoom. We analyzed user and expert ratings, product age and more factors. 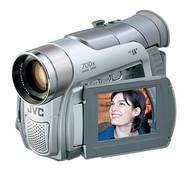 Compared to other Camcorders the JVC GR-D30 is awarded an overall alaScore™ of 66/100 = Good quality. alaTest has collected and analyzed 127 user reviews of JVC GR-D30 from Amazon.com. The average user rating for this product is 2.4/5, compared to an average user rating of 3.9/5 for other Camcorders on Amazon.com. Comments about the size and portability are overall positive. The image quality and usability are also mentioned favorably. Many are less positive about the durability and reliability. There are some mixed reviews about the zoom. 43% of the reviews on Amazon.com give this product a positive rating. This newly styled JVC camcorder is designed for those who are searching for a fun and slimline camcorder while maintaining a full feature package within. The GR-DV30E boasts a 680, 000-Pixel CCD Super High Band Processor for 520 lines of horizontal resolution. The maximum user friendliness is achieved with Power-Linked Operation (always ready to record), Night Alive (for low-light recording), High Resolution 2.5" Amorphous Silicon LCD Color Monitor, 700X Super Digital Zoom with Spline Interpolation, Digital Picture Stabilizer and Long Time Recording Capability. The GR-DV30E features the PAL format and an 800.000k sensor.